Twitter / Business InsiderVideos show Israel’s costly mistake. Israel’s military fired off a salvo of ten or so missile interceptors in a bizarre mistake that likely cost the country around a half million dollars. Israel said it mistook machine gun fire and sirens for rocket launches, which is a pretty bizarre mistake to make. 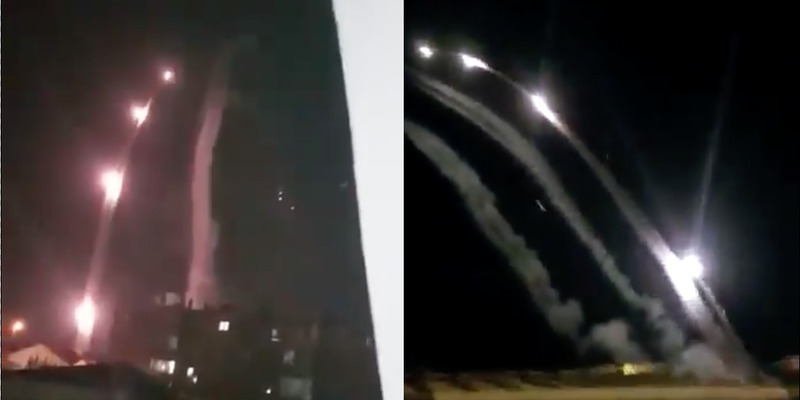 Israel activated its Iron Dome missile defence shield on Sunday night, and videos on social media show at least 10 missiles streaking across the night sky. But the missiles were fired in error, Israel later admitted. “Following reports of sirens sounding in southern Israel, unusual machine gun fire towards Israel was identified. No rocket launches were identified. The (military) is looking into the circumstances which led to the activation of the Iron Dome system,” a statement from Israel’s army said. Israel’s Iron Dome missile shield is composed of multiple different missile defence systems and batteries, and none of them run cheap. It’s likely the missiles cost anywhere from $US40,000 to $US90,000 each. Typically, the Iron Dome has a high rate of success and is one of the world’s more battle-tested, effective missile defences. Machine gun fire and sirens, while loud, hardly match the profile of a rocket launch, and isn’t entirely uncommon around the Gaza strip, making it a bizarre mistake to make. In warfare, it’s common for adversaries to use cost imposing strategies against each other. Prompting hundreds of thousands of dollars in Israeli missile launches with some cheap machine gun fire would be an extremely efficient execution of such a strategy.